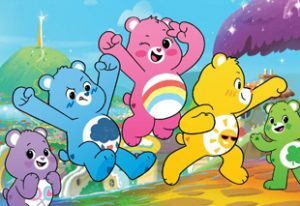 Thanks to Animation World Network we’ve learned that the ever-popular Care Bears are back again — this time exploring more of their world and its inhabitants. “Premium subscription streaming service Boomerang is set to unlock the imagination of the next generation of Care Bears fans as the official domestic home and world premiere destination for Care Bears: Unlock the Magic, a brand new 2D animated series from Cloudco Entertainment… A current take on The Care Bears that also plays homage to iconic brand elements like “The Care Bear Stare,” Care Bears: Unlock the Magic sends the Care Bears on the road for the first time, exploring wonderful, never-before-seen areas surrounding Care-a-lot called The Silver Lining. And as a result, the bears will get to meet new creatures and employ their powers and wits like never before.” Only thing we don’t know yet is a launch date. We’ll find out!